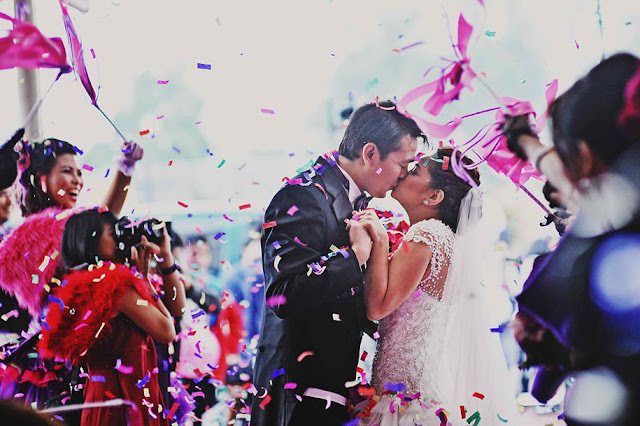 "I am a rebellious bride because I knew what I wanted, I did what I felt was right for my wedding, I personalized almost all of the details even if it took forever to finish, and I kept on visualizing ideas that could strengthen the authenticity of my rebellious wedding." What makes a wedding and a bride rebellious? What we define as rebellious may very well be different from what you think is rebellious. 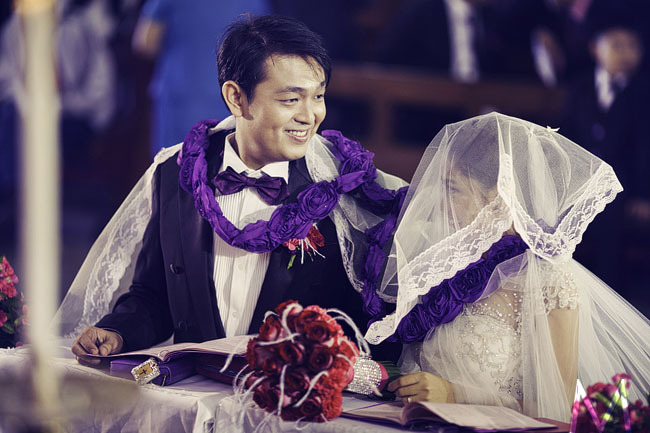 In the case of Rebellious Bride Lyanne, she is the epitome of a well-mannered, well-poised bride who, in her ivory white intricate Cecilio Abad wedding gown doesn't look at all rebellious. 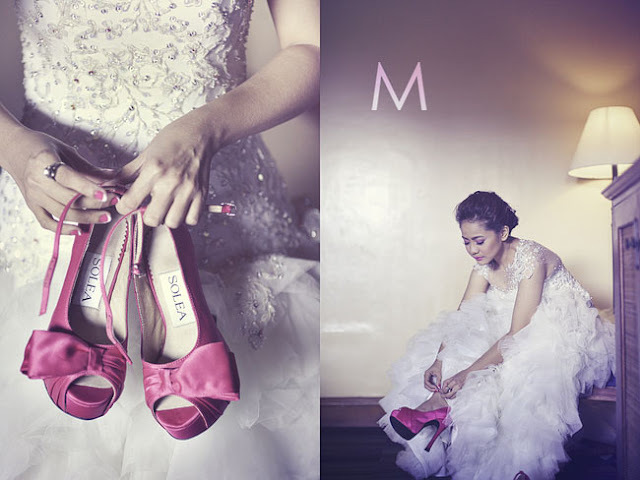 But you can see hints of her rebelliousness simply in her more than the usual bridal makeup, her deadly shoes underneath, or her crafty hands that DIY-ed so many projects for her wedding that the list you will see later on will just make you wanna give her a salute. Perhaps a colorful pair of socks, a purple Bible, a cord made of rosette, these are all very micro details that define her rebelliousness. 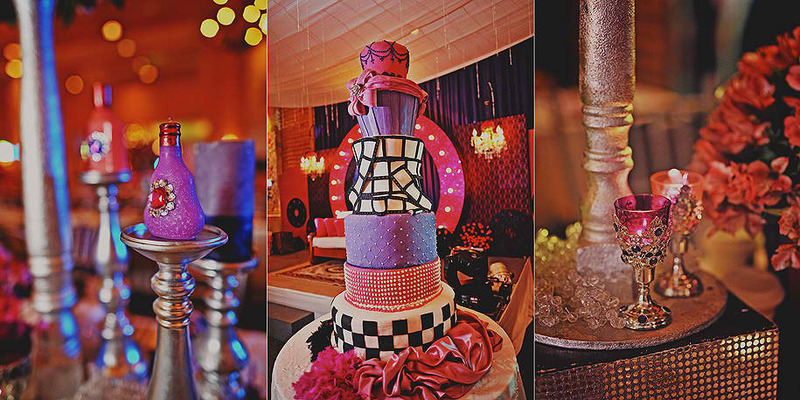 On a macro perspective though, her wedding also had the makings of an extravagant wedding with all the larger-than-life couture, the vibrant colors, the grand event styling, and top notch vendors that are all in keeping with her wedding concept which is after all, the glitzy world of Hollywood. She seemed to have had the resources to make her wedding as traditional and classic as she can ever hope for but she decided to do it otherwise. Like a Hollywood movie, this wedding is definitely a blockbuster hit filled with all the high-impact effects. 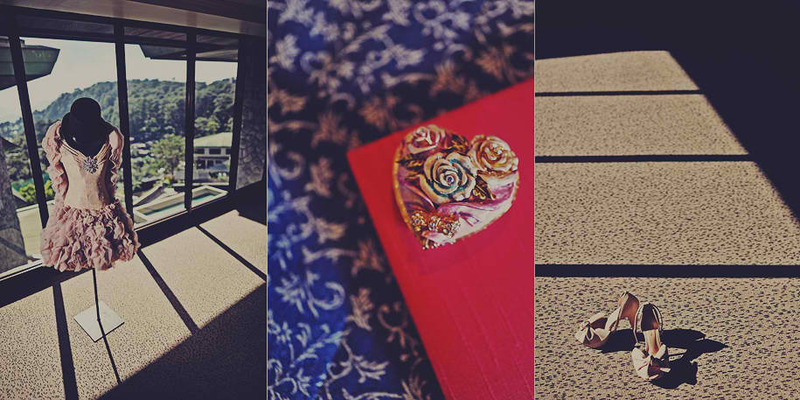 So in the rarest of occasions, we will just post the photos first as it unfolds and transitions, before we go into the bride's retelling of her experiences. And.....action! Rebellious Brides: What were the challenges you had to face since your wedding is non-traditional and how did you overcome these challenges? 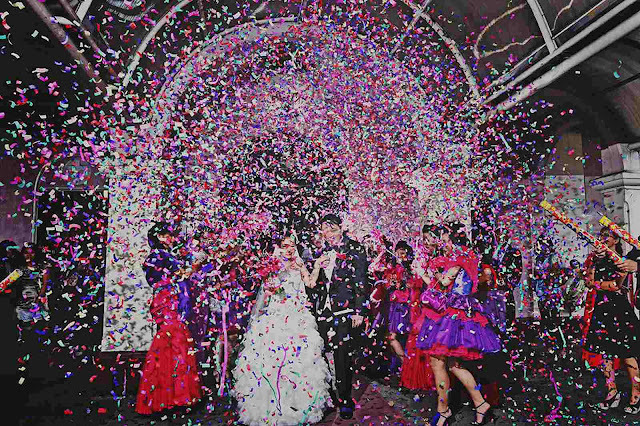 Lyanne: The most difficult one was the preparations, the tedious job of doing almost all of the details, the journey from Pangasinan, to Manila, Tagaytay, Baguio City and most of all the negative remarks that hurt much. But all of these were gone because of our great faith in each other and God who made our wedding very successful, our relatives, our awesome suppliers, our friends and our guests. RB: What advice can you give to other brides who maybe having second thoughts of having a rebellious wedding? Lyanne: Have a strong will to pursue your goal. 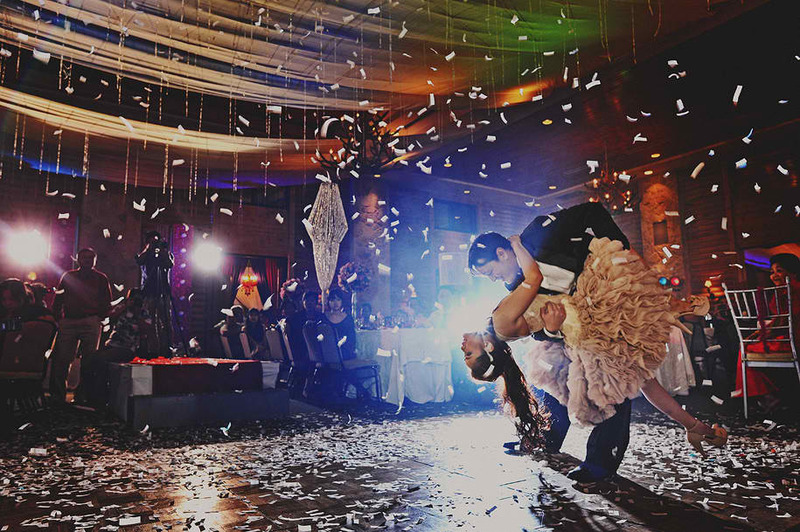 Be confident to try something distinct, do what you feel is right for your wedding, do a thorough research before you make the final decision and don’t forget to relax once in a while, enjoy every moment of your wedding preparations. Don’t stress yourself too much on the smallest of details because at the end of the day the only thing that matters is you two. If something goes wrong, calmly, decide for the right thing to do. Remember to step back and realize that the most important part of the day is when you walk down that aisle and into the arms of the person you love, the one you look forward to building your life with. 1. We used purple and fuchsia pink personalized pens for our wedding ceremony and reception, I bought a bride and groom pen then wrapped it in a fuchsia pink and purple organza ribbon. 2. 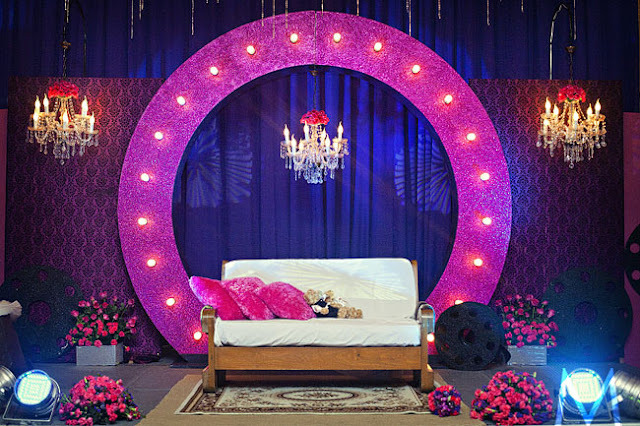 The ring and arrhae were in a metal heart holder and were placed in a custom made pillow. 3. The entourage flowers and boutonnieres had a trinket which is their names' initials. 4. 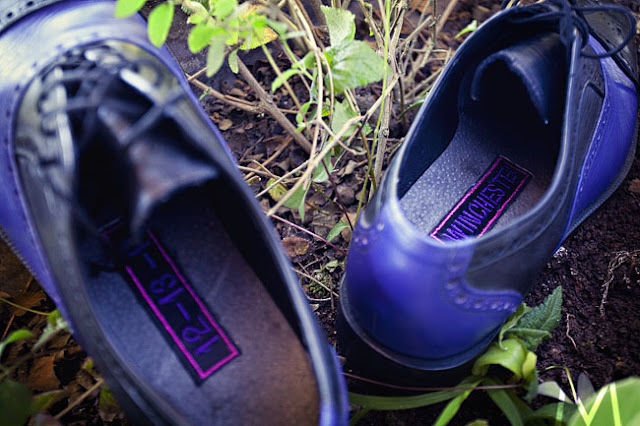 The groom wore a custom made purple and black brogues with his name and date of the wedding embroidered in it. 5. 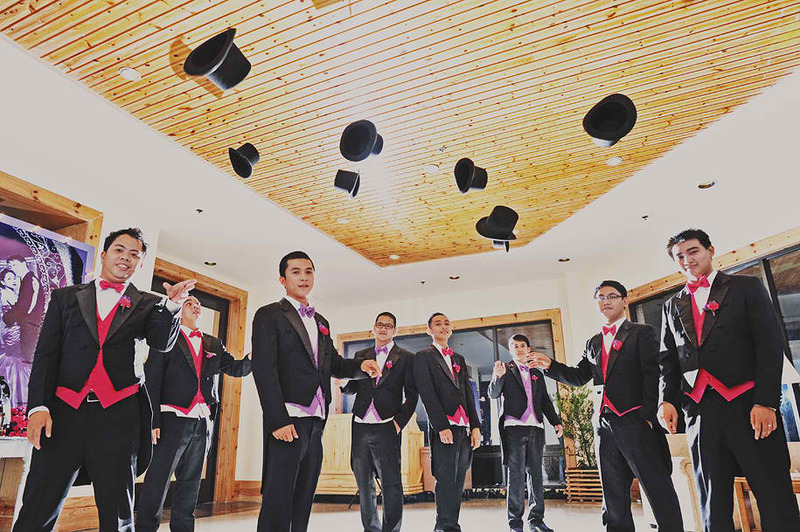 The groom wore a purple and black socks to match his shoes. 7. We used a purple bible then clothed it in a fuchsia pink and purple customized bible holder. 8. We used a lighter match to light our candles. 9. 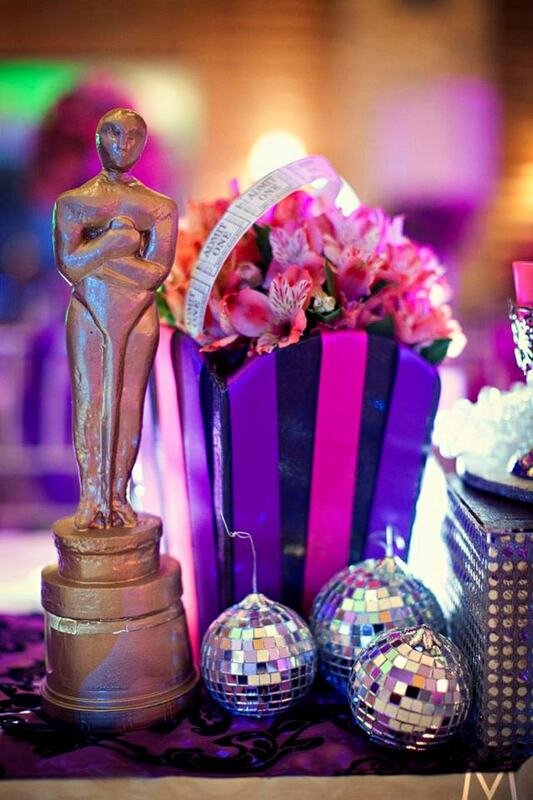 For our souvenirs(DIY), we used a Old Hollywood inspired musician statue. 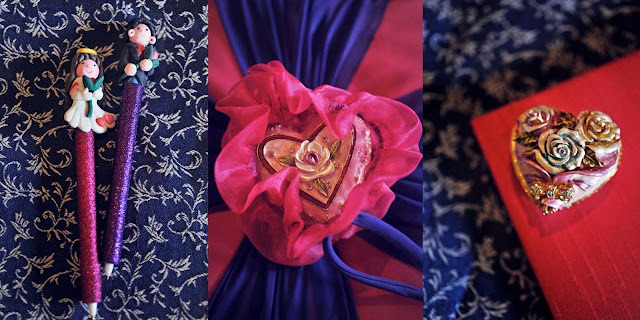 I clothed the statue purple and fuchsia pink fur lace then enclosed it in a round acetate box with pink and purple satin ribbon, I printed the thank you cards and added our monogram and caricature to make it more personalized. 10. The male entourage used fuchsia pink and purple socks. 12. The flower girls used identical floral brogues, black and fuchsia pink gloves, purple and fuchsia pink oversized headpieces. 13. The bridesmaids wore two different colors, the 3 bridesmaids wore puffy purple tulle cocktail gowns with fuchsia pink petticoats, a large purple bow in front, and a fuchsia pink fur shawl. 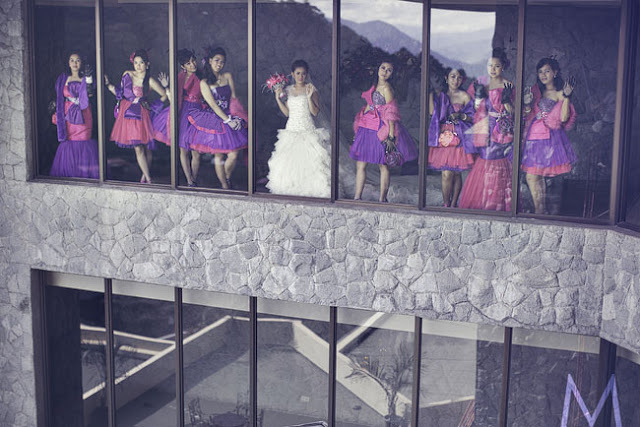 The other three bridesmaids wore puffy fuchsia pink tulle cocktail gowns with purple petticoats, a large fuchsia pink bow in front, and a purple fur shawl. 14. The secondary sponsors wore mermaid cut gowns with large bows at the front. All three of them wore the same design but with different colors..
15. I wore a birdcage veil at the reception from Gargantilla. 16. 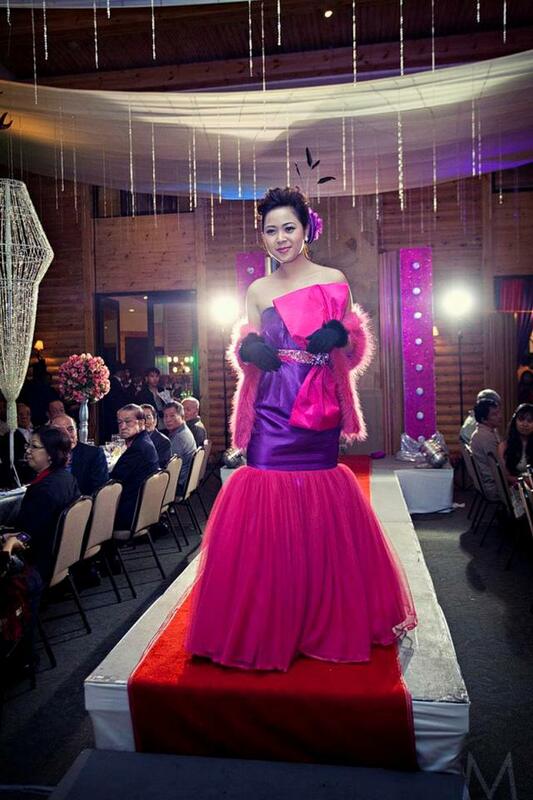 I wore two different gowns (for the ceremony and the first dance) both by Cecilio Abad. 17. The female entourage used wedding wands while the male entourage used 6 large party poppers after the ceremony. 18. We used purple rosette wedding cord (DIY). 19. 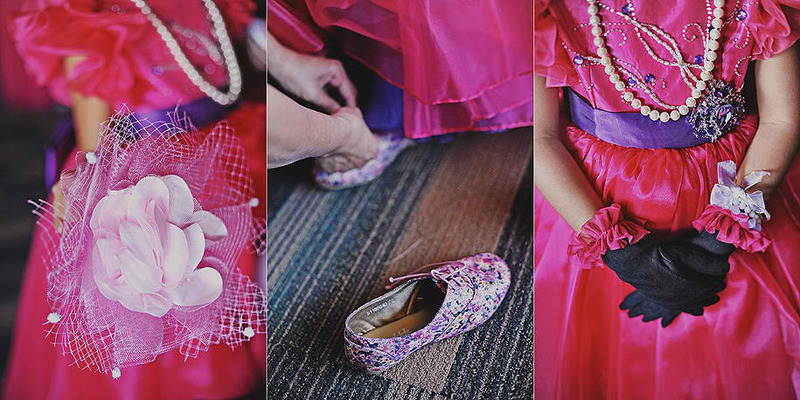 I wore a 5 inch fuchsia pink peep toe pumps at the ceremony. 20. 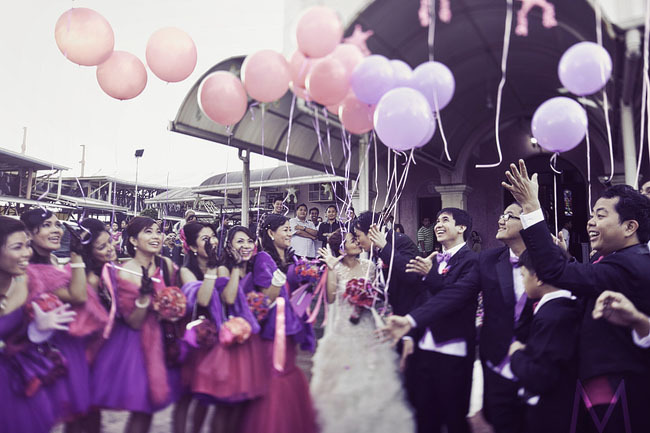 Instead of the traditional doves, purple and pink balloons were released as a way of marking our union. 21. After the ceremony we went to camp john hay for pictorial, I walked through the forest of pines barefoot. 22. Our wedding cake is Old Hollywood inspired. It is 6 tiered, purple and fuchsia pink fondant cake with filmstrip design. 23. 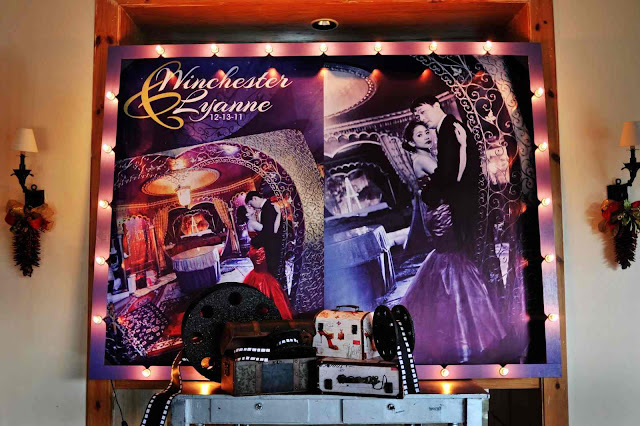 Our wedding reception was old Hollywood inspired, it was full of filmstrip design. 24. Old movie titles in a filmstrip frame were used as table markers. 27. DIY table markers and menu in a filmstrip frame. 29. Old Hollywood inspired coffee tumblers were used as place cards. 30. 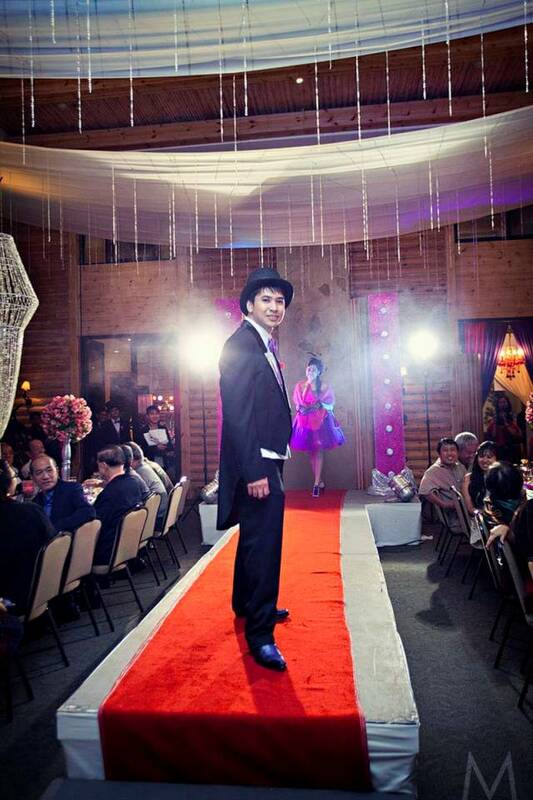 For the reception grand entrance, we wanted our guests to enjoy so we thought of having our entourage do a ramp walk for their grand entrance, it was like a fashion show, the guests and the entourage both enjoyed it. 32. There was a dance number with the entourage, the males danced to the tune of Thriller by Michael Jackson while the females danced to the tune of Candyman. 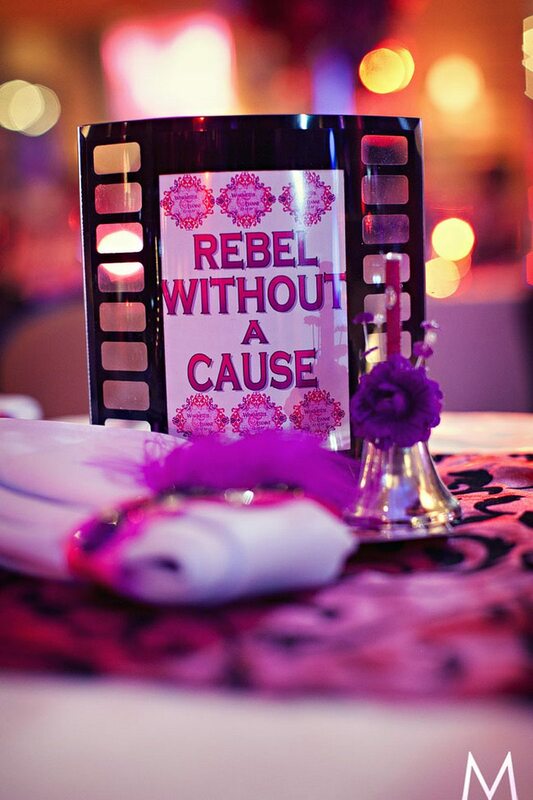 We totally had a lot of fun with our rebellious wedding!